Description: Holding fort on the beachfront is The Library’s iconic restaurant, The Page. With a menu offering of Thai and international fusion and a host of “Original Experiences” found nowhere else, the renowned restaurant has inevitably made its mark on Koh Samui’s upscale dining scene. On the menu is a curated collection of rare, old-kingdom Thai cuisine which are now absent in contemporary dining tables. These are hard-to-find, original recipes, but with a decidedly modern and creative presentation. The Page also introduces the concept of “Samrab Thai,” which combines the 8 distinct flavor and texture profiles of traditional Thai cooking into a majestic dinner feast that’s meant to be shared. We had a great experience! We tried the tasting menu, with 11 different types of food and it was a great adventure on topical Thai food! Really recommend. Besides that, the decoration of the restaurant and the staff are great!! Thank you very much for your visit to The Page restaurant and leaving us a great review. We are so glad to hear that you really enjoyed our 11-course degustation menu “Samrab Thai” which combines the eight distinct flavors and texture profiles of our traditional Thai cooking. We are happy to hear that you enjoyed the restaurant ambiance as well as our staff services. Thank you again for giving us the perfect score, it keeps us motivated to work harder and give the best for our guests. Please do visit us again when your travel plan ever bring you back to Koh Samui. It will be our sincere pleasure to being of your service again. Good place to spend couple hours when your baby sleeps: convenient (to say nothing of some numerous and very noisy guests who travel in large groups, take 2-3 big tables around and speak loudly like if they bought this restaurant ), nice interiors , great sea view , interesting red swimming pool of the hotel . 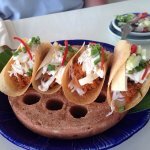 The food is ok, but nothing special at all and that is why looks too expensive (1,5-2 time more than in some good restaurants on the island). The team seemed to be very welcoming and nice, maybe not the fastest , but they didn’t forget anything, probably cocktails are good and I just made a wrong choice, coffee is quite average (again , especially for its price). But overall nice place for spending time on a beach. Thank you for choosing The Page restaurant for your recent dining. We are pleased to learn that you appreciated the restaurant design, the iconic Red pool as well as the beach front location of the restaurant. We are glad to learn that you appreciated the overall dining experience with us, however it did not really exceed your expectations or gave you a wow factor. It would be great if we can learn more from you on this aspect and we would highly appreciate it if you could please contact us at gsm@thelibrarysamui.com. Meanwhile, we do apologize if a large group of our customers were too loud, we only wish you could have informed us so we could personally talk to them on your behalf. We do hope that we will have a chance to welcome you back to spend another fine afternoon at The Page in the nearest future, every effort will be made to take the better care of you. Remaining always at your service. 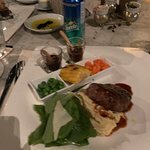 I just visited there yesterday for the first time and felt so impressed with the restaurant and hotel. Security at the main gate was very helpful to find space to park a car for us. Me and friend ordered 2 Thai dishes -- Pla Pla Tuna and Yum Pla Salid (we actually just wanted to order finger food). Everything was fantastic even drinks that we had. But there's one thing that I want to suggest.. waitress takes too much time to come back for taking order, we finished deciding menu for a while until we had to raise our hands for assistance. It is our pleasure to hear your appreciation of the warm welcome of our Security team of a hotel. We are also happy to learn that you really enjoyed both food and beverage selections at The Page. In the meantime, we have well noted on your comment that staff attentiveness can be improve on, and thank you for pointing it out to us. We will share and address your constructive comments to our team for immediate improvement. Despite of this, we are delighted to know that we made your recent dining with us a memorable one. Look forward to welcoming you and your friend back to The Page in many more occasions. 나는 다음에 또 꼭 와서 먹어야겠아요. You can see the ocean view. Staffs are all good. espeacially Tarn. Next time i will visit again. I really recomand this place. Thank you for choosing The Page restaurant for dining during your holiday in Koh Samui. We are very grateful for leaving us an amazing feedback. 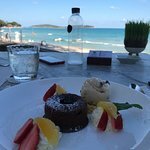 It is truly a pleasure to learn that you had a great dining experience and really enjoyed our fine food, good service , and a beachfront location with a nice chill out music. Thank you once again for giving us the perfect score. Please do visit us again when your travel plan ever bring you back to Koh Samui. It will be our sincere pleasure to being of your service again. From the moment you sit down the service is amazing & attention to detail. The staff are extremely polite & well informed. The back drop of the beach & water makes this an outstanding venue for lunch. 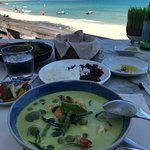 Our best lunch meal so far on Koh Samui & already can’t wait to return on our next trip. The prices for the quality of food is extremely reasonable. Would totally recommend for anyone looking for a lazy, luxurious lunch on the beach. This is your venue. Thank you for choosing The Page restaurant for a dining during your holiday in Koh Samui. 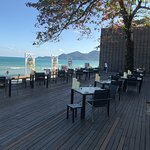 We are pleased to hear that you appreciated the restaurant atmosphere and beach front location with Chaweng beach as a backdrop. It is truly a pleasure to learn that you had a great lunch and really enjoyed our fine food with reasonable price. Thank you for praising our staff for excellent service with great Thai hospitality. It is indeed a pleasure to hear your kind and encouraging words and we will share them with our members and it certainly brought many smiles among us. Thank you again for giving us the perfect score and it means a lot to us. Last but not least, we truly appreciate your kind recommendation of The Page to other foodies on TripAdvisor. Look forward to being of your service again soon. Been to The Page? Share your experiences!